If you recall, we used to have a weekly mantel party here, and then…it died. I killed it. And now, I regret that decision. I miss your mantels. I miss you. I miss looking at your mirrors, and frames, and flowers, and candlesticks, and bird nests, and brilliance. But we all decided that mantels were not inclusive enough and discriminated against those of us who are mantel-barren. We all decided that mantels are NOT meant to be changed weekly. We all decided it was time for a change. Get your flat surfaces ready because party is on the last Wednesday of each month. We’ll kick the party off next Wednesday! Uh, because it’s the last Wednesday of the month. See you then…candles, bird nests and all. Feel free to grab a party button if you would like to help me spread the word. I tried to make it scream Spring because that is just the mood I’m in. Wahoo sunshine! If you need the button to be smaller, just holler. I can make it happen. Happy vignetting peeps! I'm so glad you brought this party back. I was late to the party the last time around and was so inspired by all of the cute ideas. I have no mantel to decorate but after seeing all of the other cute ideas I was inspired to refinish a large shelf I have been holding on to for years. I even got it up on the wall and decorated…then the party died 🙁 I'm glad it's back. I can't wait to see all of the ideas! Very cute title! I got ya tagged in my favorites for this party! ohh how fun! Can't wait to join in. I've got lots of surfaces. Some that are finished and some that need inspiration! Awesome idea! I redid my mantel just for spring…just for you…haha! 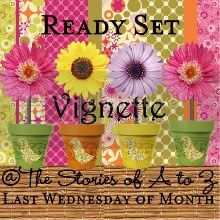 I can't wait to link up some vignettes next week! Yay! That is the cutest button! I can't wait to link up. I need to finish my mantle. Thank goodness I have another week. But I have a mantel pic all ready for you!!!!!! Grrrrrr……. I love looking at all the creative mantels! Mine needs a whole barrel full of help. It is sad and lonely. Two candles sit and look at each other from opposite ends of the mirror. They are crying for relief. Help, help! Make us beautiful…or lay us to rest. What a fun party!! I didn't realize you killed the mantle party. I was just wondering when you next one was going to be! I am excited — it will be fun! yeay! I've been waiting for your party to debut my revamped mantle. just to clarify – is the party the 24th or 31st? Looking forward to it ! I do need a smaller button if you have one, thank you. Yay!!! I'm so excited. 🙂 I had been missing your mantle parties too. I've actually been checking back over here every so often to see if you decided to re-instate it. lol. I have gotten my little mantle all prettied up for Easter, and now I can't wait for the link party. Woohoo! Can't wait. 1. That is the cutest button EVER! 3. You have very cool party ideas! Now you are talking! I have made note of it and I'll start brewing on ideas! Cool party idea! Love it! And just in time for a bunch of Spring make overs. I like this new spin on the "Mantel Party". I'm sure we'll see lots of great Spring and Easter displays. Bring out the bunnies! Buttons up! : ) Doesn't it figure ~ I put my mantel back in stages to take pictures after I painted that mirror oil rubbed bronze. I can still use it for this party though!